The main odometer is slowly approaching 24000 miles. 24k would be almost 5k after I changed the oil the last time and so it was time. 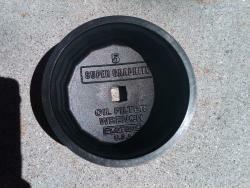 A gallon of Mobile 4T 15x50 has cost me approx $40.00 + about $3.00 for the oil filter. Oil change at the local dealership was quoted at $90 (+taxes), read $100. Doing the job my-self = saving $55.00. Bonding with my transportation = priceless. 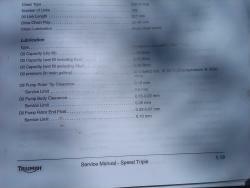 I have idled the motorcycle for 5 minutes and then turned it off let is seat for 10 minutes as recommended in Triumph's service manual. It is important to note that Triumphs Speed triple should be on the level ground and parked on it's SIDE STAND. 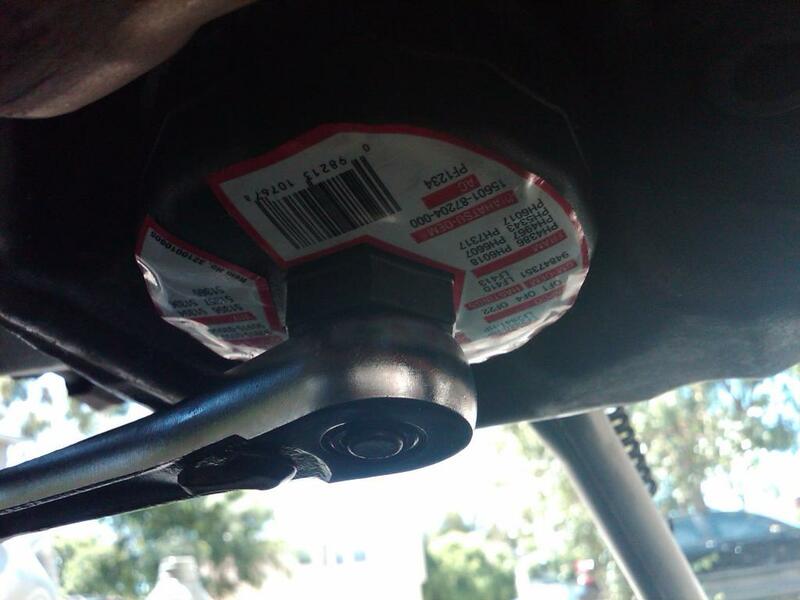 As this lean angle provides for fuller oil drain (I tested this by draining the oil while the bike was on the center stand and then then removing the center stand placing the motorcycle on it's side stand. 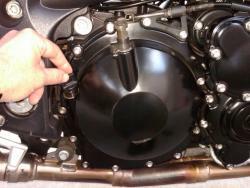 Another 100ml or so of oil drained after placing it on the side stand. 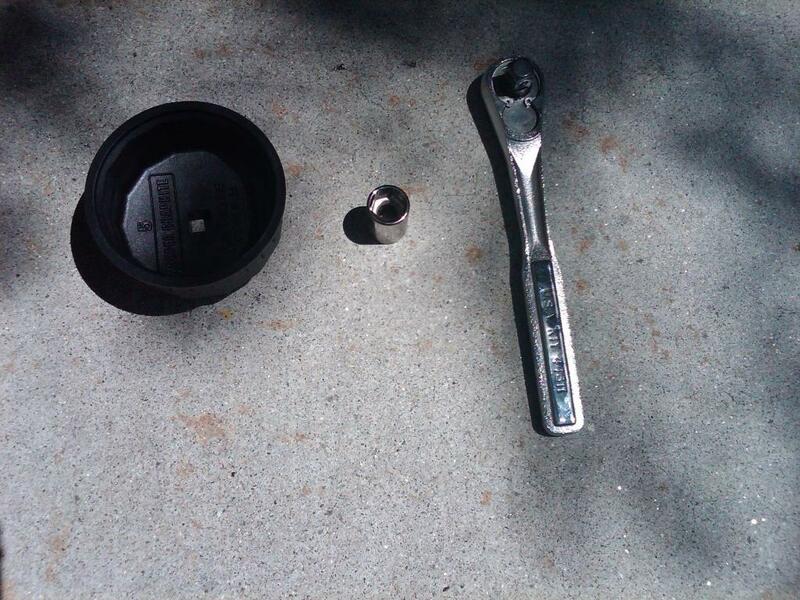 After laying some old rags underneath the bike to absorb the the few drops of oil that was bound to get spilled (i didn't want to stain the driveway) I partially unscrewed the oil drain screw. 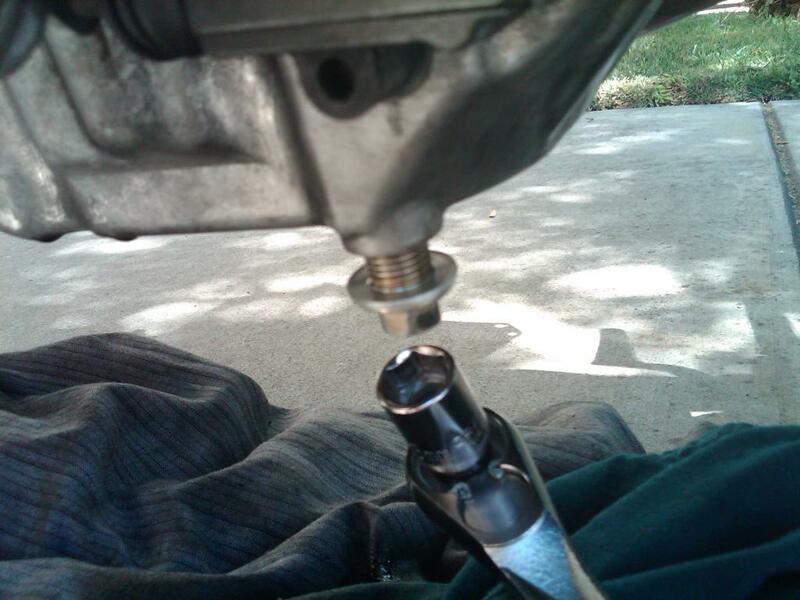 One it was part of the way out I inserted and old 1 gallon plastic milk jug underneath the oil drain screw and removed the screw with my fingers (I wore nitrile gloves, I as hear used oil is not exaclty the healthiest substance for you skin). Once the old oil stopped flowing from the drain plug I removed the filter wit hte rachet and the oil filter attachment. 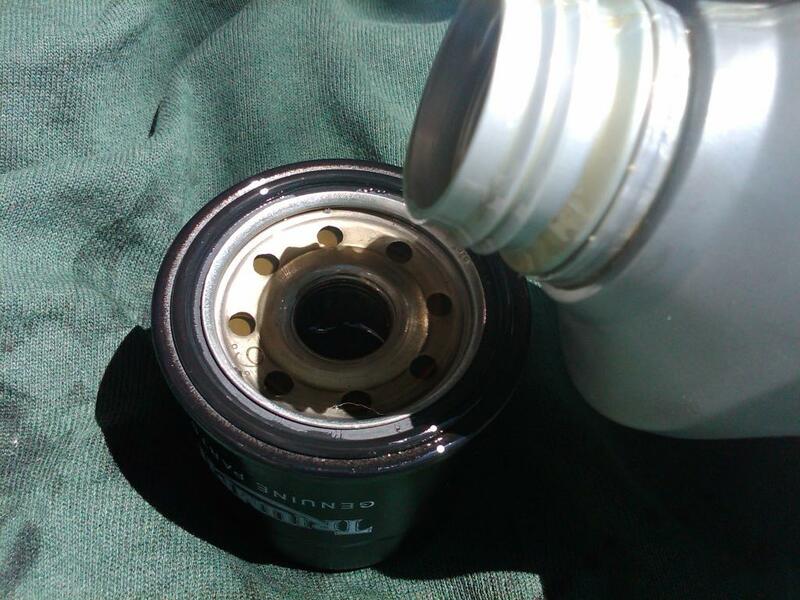 Removal of the filter caused some addtional old oil outflow from the oil filter port and the drain plug as well (glad I had several layers of old rags underneath the motorcycle). Before installing the new oil filter, I filled it with new oil. It took approx. 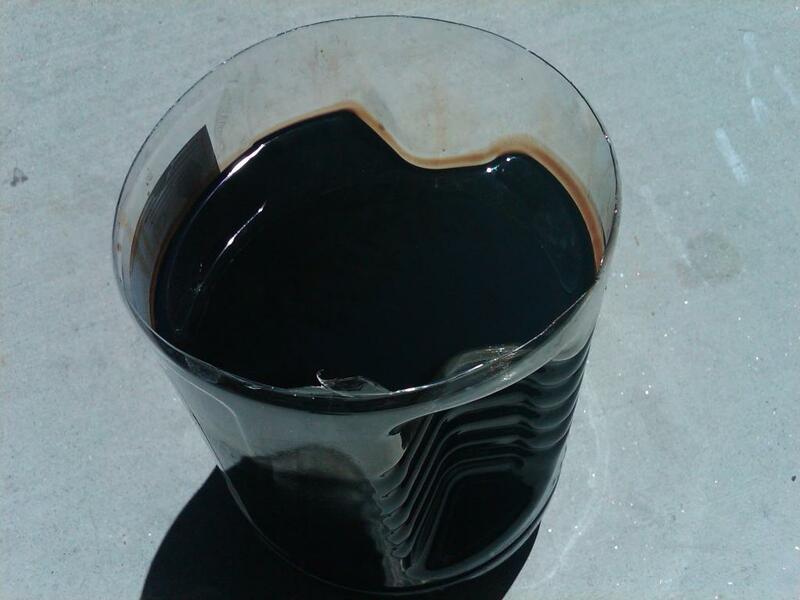 3 cycles of filling it, waiting for the oil to absorb in to the filter material and filling it again. This would eliminate the air bubble in the filter, so on the first start after oil change the oil pressure reaches it's optimum in the shortest possible time. 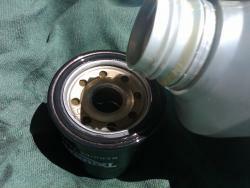 Then I wetted the filter's o-ring with some new oil and installed it in place of the old filter. 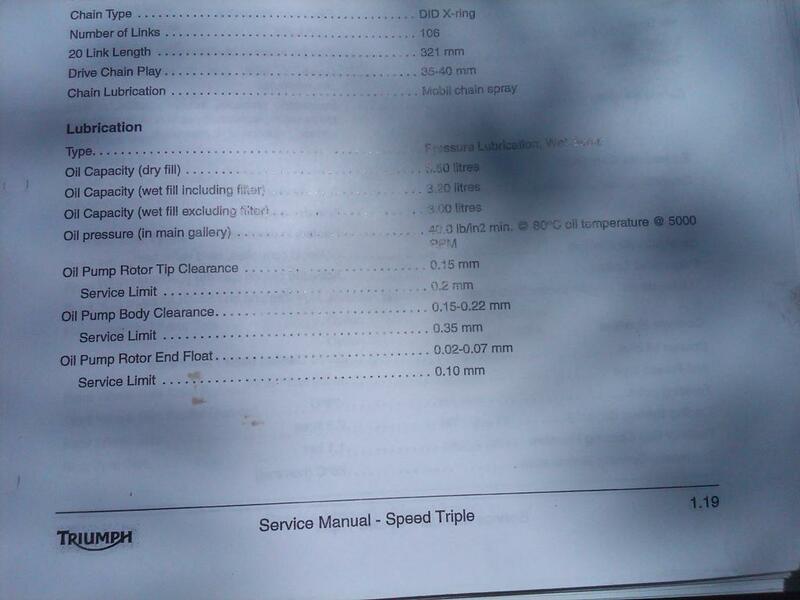 Triumph service manual has the data for volume of oil needed in different scenarios, i.e. dry fill, wet fill ..etc. I highly recommend to get one, if you are going to service your bike yourself. At this point I screwed back in and tightened the drain plug and the filter and was ready to refill the bike with new oil. 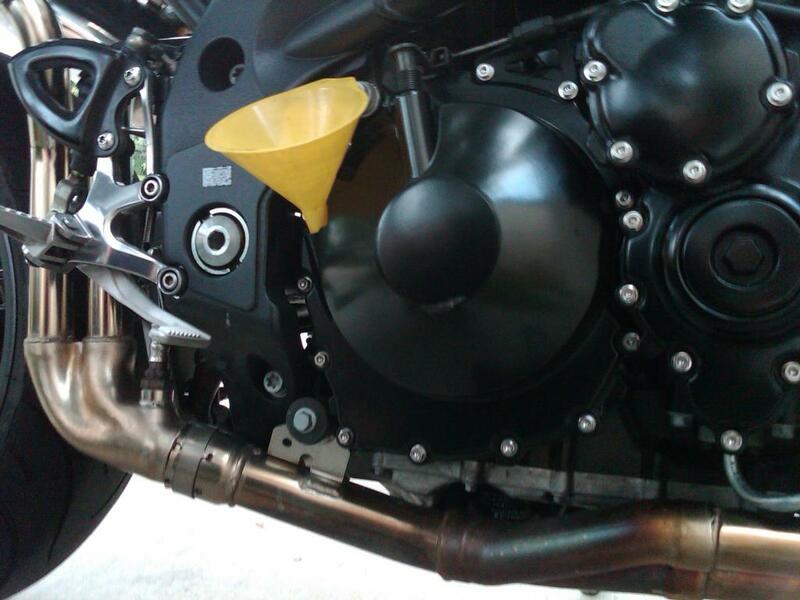 and used a small plastic funnel to fill the bike with oil. Mental note: USE THE DIPSTICK TO VERIFY THE OIL LEVELS OFTEN. If you overfill you will have to remove the oil drain plug and drain some of the oil. Operating this bike with oil overfill is big no no. 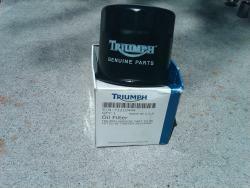 I used Triumph recommended Mobile Synthetic 10w40 T oil. It's expensive, Will do some research and see if I can find a better priced alternative. If one of you who are reading this knows of a good alternative, please leave a comment with your recommendation. TIA ! Old oil after being drained. It looks ready for the change. I took it back to the auto parts store where I bought the new oil and they recycled it for me with no additional charge. Submitted by rnexussix on Sat, 05/28/2011 - 11:59.
according to the manual, you have to measure the oil level with the bike vertical (not on the side stand). Also the dipstick has to be screwed all the way in to get the correct oil level. 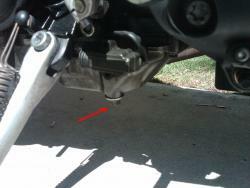 I simply sit on the bike and hold it vertical that way when I check the oil level. Submitted by rnexussix on Wed, 09/21/2011 - 14:39. 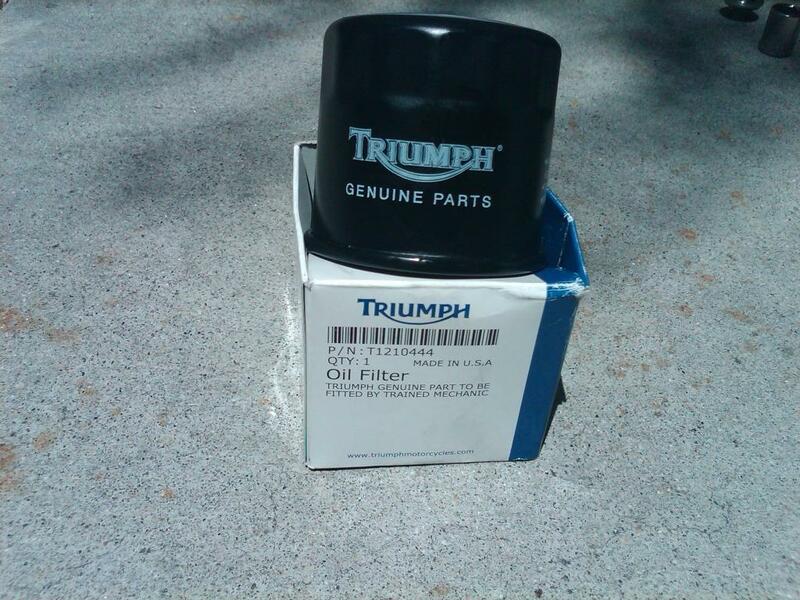 I got tired of paying US$12.00 for the Triumph OEM oil filters and after doing some internet research found other filters that are compatible with my Speed Triple. Prices ranged $3.50 - $7.50 depending on the filter brand and model. "Long' version is about 1" longer then stock, but no ground clearance problems have been reported. 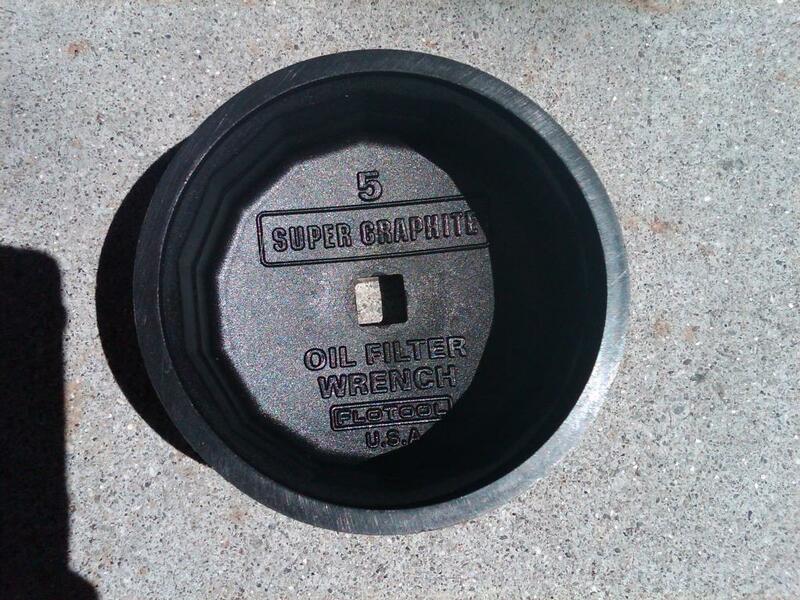 I personally use the short (stock) length oil filter. Simply don't like seeing it jutting out beneath the bike. Purolator & Bosch seem to be among the better one’s, then SUPERTECH is the best value. Most of the info above came from this link. Submitted by rnexussix on Mon, 05/21/2012 - 09:40. Check page # 60 an onward. Submitted by rnexussix on Thu, 05/23/2013 - 11:06. You are welcome ! Please consider contributing a how-to of your own to this great website.